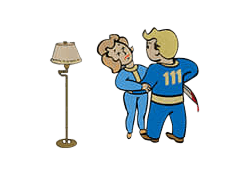 Lady Killer is a Perk in Fallout 4. It is associated with the Charisma Stat. Rank 1: You're charming... and dangerous. Women suffer +5% damage in combat, and are easier to persuade in dialogue. Rank 2: Women now suffer +10% damage in combat, and are even easier to persuade in dialogue. They are also easier to pacify with the Intimidation perk. Rank 3: Women now suffer +15% damage in combat, and are much easier to persuade in dialogue. They are now even easier to pacify with the Intimidation perk.